For Deke‘s loving review over at Arena Rock – Thunder Bay and Beyond, click here! Five records in, and it’s time for a double live. 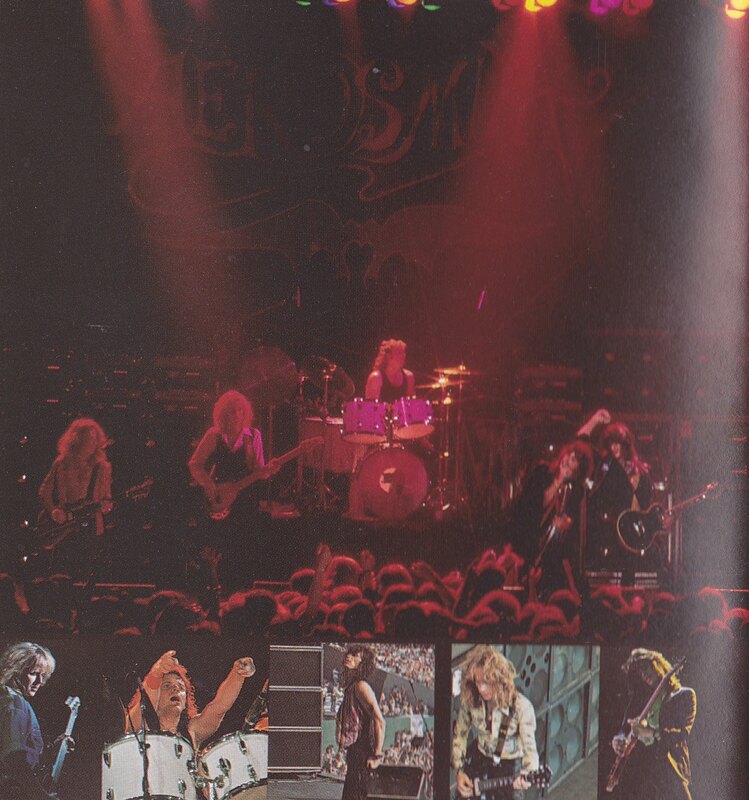 Aerosmith had gained a reputation for their fiery live shows, and bootleggers were ensuring that fans willing to pay had something live that they could buy. 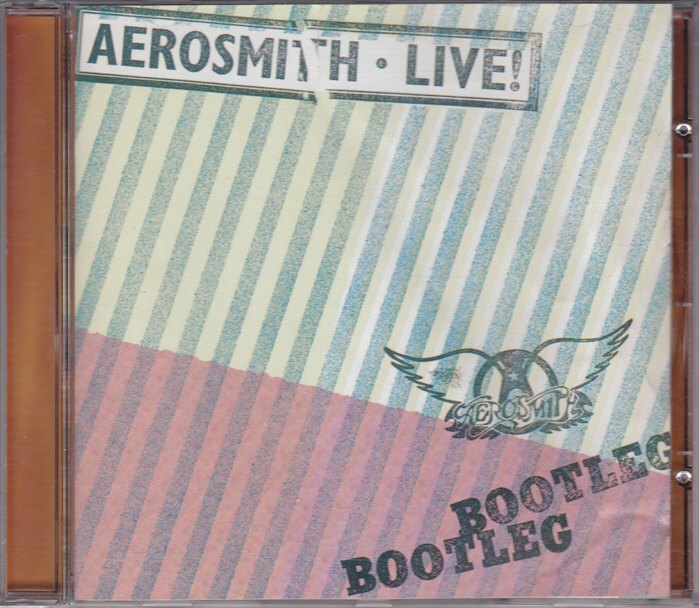 The way to beat the bootleggers was for Aerosmith to put out their own official live album. Collecting tracks from a variety of live performances and radio broadcasts, including many songs unavailable on album, Live! Bootleg is today one of the best examples of the epic double live. The intentionally shoddy album art conceals within it a live record of nuclear critical mass. With liner notes, photos, and even hidden tracks, Live! Bootleg hits all the bases. “Back in the Saddle” recorded in ’77 is chosen to open the proceedings, which it does with the kind of rawness that only comes with a real live performance. Unfortunately it’s a thin sounding version, but fear not because “Sweet Emotion” in March ’78 is full of guitar noise. The liner notes state that there are no synthesizers on the song, just guitars “screaming in pair”. Then “Lord of the Thighs” from the same gig keeps the momentum going smooth and dirty. The extended jamming stretches the song out to the seven minute mark, and that is the kind of noisy spontaneity that wasn’t captured on any of Aerosmith’s studio albums. “Toys in the Attic” was recorded in the boys’ home town of Boston, straining at the leash. It’s a fevered live take, faster and more reckless. Then, also from Boston is the Tyler/Whitford classic of Aerofunk tastiness, it’s the “Last Child”. Live (in a club), it’s funkier and slinkier. The first surprise rolled out on the album is the Beatles cover “Come Together”, from a secret gig in ’78 at the band’s headquarters the Wherehouse. It’s very similar to the studio version they did for the Sgt. Pepper’s Lonely Hearts Club Band soundtrack, perhaps a bit slower and more menacing. Joe Perry dusts off the talk box for an ultra-funky “Walk This Way”. In Deke’s review at Arena Rock, he said “Joey [Kramer] sets the tone and man he’s driving the bus at break-neck speed.” That’s it exactly! This is Aerosmith starring in that movie about the bus that couldn’t slow down! (I think it was called The Bus that Couldn’t Slow Down.) As if that isn’t hot enough, a smoking “Sick as a Dog” from ’77 crashes the damn bus over the guiderail and off into the sunset! Lots of tasty extended soloing here. Bringing back the funk of “Sight for Sore Eyes”, there is no time for rest, and from there it’s straight into “Mama Kin”. Everything that the first Aerosmith album lacked in out-of-control raucousness is intact on this live version. Without a breath they tear into “S.O.S. (Too Bad)”, ablaze with the intensity of fully-fuelled Aerosmith. There’s an awkward transition between “S.O.S.” (recorded ’77 in Indianapolis) and “I Ain’t Got You” (1973 for a radio broadcast). The younger band sound very different, less wartorn and ragged from the drugs. They go straight into James Brown’s “Mother Popcorn”, complete with sax. It’s the funkiest thing Aerosmith have ever done by a long shot. Material like these tracks are perfect examples why Live! Bootleg is so beloved today. They were giving you value for your money, and songs that you didn’t have, but didn’t know you didn’t have! The next surprise is the unlisted “Draw the Line”, a live version so over the top that perhaps it even surpasses the original! Wait until you get to Tyler’s screams if you don’t believe me. Checkmate honey! After a tracklist like this, ending the album with “Train Kept a Rollin'” (Detroit 1978) is one of the only options left. Probably tired from an energetic set, Tyler gets the audience’s help on the chorus. Joe Perry’s hanging by a thread but still able to piece together some gratuitous solos. He throws in a bit of Sinatra’s “Strangers in the Night” for shits n’ giggles too. Live! Bootleg ends on an overindulgent but perfectly appropriate note. The radioactive fallout from their double live album bought Aerosmith, burning out fast from the inside, a little more time before being required to produce something new. Even then they were breaking from the strain. Something had to give. Fortunately before imploding, Aerosmith managed to crank out the obligatory double live album that helped seal their place in rock history. Check that one off the box! Brilliant review Mike – I’ve added it to my ‘must have’ list … Damn you! Vinyl dude, gotta get it. Yup Joe this is the ultimate live album in my book! Mikey, awesome well written review. I’m sending this one to Tbone as well as its official that Brand Tbone is expanding into other people’s blogs! Hahaha….. Huge undertaking to hammer out a back catalogue and a classic one at that of Aerosmith! I’d forgotten about this! I had a copy of this on CD! Absolutely marvellous live album – and one of the few must have live albums, I reckon. Great bit of writing, sir … and I’m with the 1537 guy there – just gone added this to my list! I never agree with 1537. Adds to his ego. Already out of control. Cool review Mike. I don’t listen to this one much to be honest. Deke’s review and now yours have compelled me to give it another spin and… I don’t know what it is about it but it just doesn’t grab me for some reason. I prefer the studio albums. I realise I’m probably in the minority with this opinion! Maybe I just need to spend more time with it? I think so. It’s a lot to absorb and you could probably spin it 3 or 4 times without absorbing it all. I listened to it yesterday again. I’ve listened to it quite a few times but there’s always about a year between listens cause I don’t enjoy it that much. I’m always at the “I’ll give that another go and see if I like it” stage. Haaha I will. I’ve got it on the mp3 player now so I’m going to try and drill it into me. I really want to know what I’m missing! If I owe you for this, Deke will help me pay half the bill. Yep HMO Mikeys right. I will give you a Nickle Back! Hahahaha…But that ain’t gonna happen..this is The Best live album ever! Myself and Tbone can’t be wrong! Ha!